by Chris Woodford. Last updated: April 16, 2019. Suppose you had to design the perfect material—what would it be like? You'd probably want it to be plentiful and relatively inexpensive, strong and lightweight, easy to combine with other materials, resistant to heat and corrosion, and a good conductor of electricity. In short, you'd probably come up with a material like aluminum (spelled aluminium in some countries—and that's also the official IUPAC spelling). It's the commonest metal in Earth's crust, the third most plentiful chemical element on our planet (only oxygen and silicon exist in greater quantity), and the second most popular metal for making things (after iron/steel). We all see and use aluminum every day without even thinking about it. Disposable drinks cans are made from it and so is cooking foil. You can find this ghostly gray-white metal in some pretty amazing places, from jet engines in airplanes to the hulls of hi-tech warships. What makes aluminum such a brilliantly useful material? Let's take a closer look! Photo: Aluminum is a wonderfully weather-proof material. This is a detail of Sky Cathedral, an aluminum sculpture outside the Federal Building and U.S. Courthouse in Urbana, Illinois, United States. Photo by Carol M. Highsmith, courtesy of Photographs in the Carol M. Highsmith Archive, Library of Congress, Prints and Photographs Division. Aluminum is soft, lightweight, fire-proof and heat-resistant, easy to work into new shapes, and able to conduct electricity. It reflects light and heat very effectively and it doesn't rust. It reacts easily with other chemical elements, especially oxygen, and readily forms an outer layer of aluminum oxide if you leave it in the air. We call these things aluminum's physical and chemical properties. 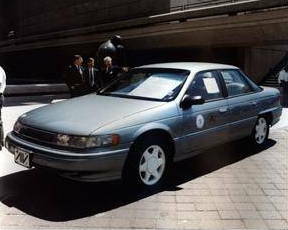 Photo: The experimental aluminum Ford Sable car, produced over 20 years ago in 1995, was 180 kg (400 lbs) lighter than a comparable steel-bodied car and considerably more energy efficient. Today, as fuel economy becomes ever more important, full-bodied aluminum cars are becoming much more common (especially in the high-end, luxury market). The aluminum content of a typical car is expected to double by 2025, according to the Aluminum Association. Photo courtesy of US Department of Energy (DOE). Aluminum really comes into its own when you combine it with other metals to make aluminum alloys (an alloy is a metal mixed together with other elements to make a new material with improved properties—it might be stronger or it might melt at a higher temperature). A few of the metals commonly used to make aluminum alloys include boron, copper, lithium, magnesium, manganese, silicon, tin, and zinc. You mix aluminum with one or more of these depending on the job you're trying to do. Aluminum can be combined with other materials in a quite different way in composites (hybrid materials made from two or more materials that retain their separate identity without chemically combining, mixing, or dissolving). So, for example, aluminum can act as the "background material" (matrix) in what's called a metal matrix composite (MMC), reinforced with particles of silicon carbide, to make a strong, stiff, lightweight material suitable for a wide variety of aerospace, electronic, and automobile uses—and (crucially) better than aluminum alone. Chart: Aluminum consumption in the United States. 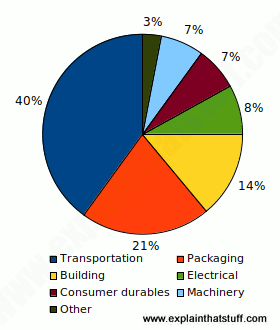 Transportation (planes, ships, trucks, and cars) is now by far the biggest single use for the metal and its alloys. Source: US Geological Survey, Mineral Commodity Summaries: Aluminum. February 2019. Pure aluminum is very soft. If you want to make something stronger but still lightweight, hard-wearing, and able to survive the high temperatures in an airplane or car engine, you mix aluminum and copper. For food packaging, you don't need anything like the same strength, but you do need a material that's easy to shape and seal. You get those qualities by alloying aluminum with magnesium. Suppose you want to carry electricity over long distances from power plants to homes and factories. You could use copper, which is generally the best conductor (carrier) of electricity, but it's heavy and expensive. Aluminum might be an option, but it doesn't carry electricity so readily. One solution is to make power cables from aluminum alloyed with boron, which conducts electricity almost as well as copper but is a great deal lighter and less droopy on hot days. Typically, aluminum alloys contain 90–99 percent aluminum. 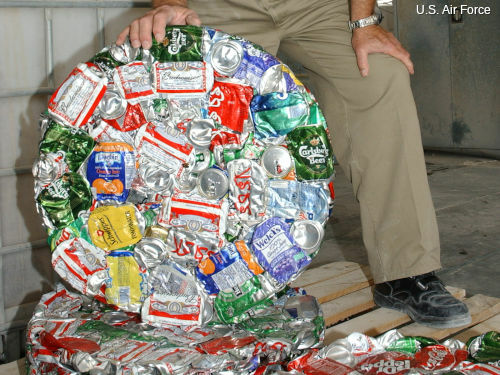 Photo: Ready for recycling: These squashed mats of aluminum cans are called biscuits. They're ready to melt down and recycle. According to the Aluminum Association, nearly 70 percent of the aluminum ever mined is still in use today, thanks to effective recycling programs. It's much cheaper and more environmentally friendly to recycle used aluminum than to dig bauxite from the ground and process it: recycling saves about 95 percent of the energy that would be needed to make brand new aluminum. Photo courtesy of US Air Force. Aluminum reacts so readily with oxygen that you never naturally find it in its pure form. Instead, compounds of aluminum exist in huge quantities in Earth's crust as an ore (raw rocky material) called bauxite. This is the common name for hydrated alumina, a substance typically made from about two thirds aluminum oxide (chemical formula Al2O3) with one third water molecules (H2O) locked into its crystal structure. Depending on where on Earth it's found, bauxite also contains a range of different impurities such as iron oxide, silicon oxide, and titanium oxide. The world currently has about 55–75 billion tons of bauxite reserves—enough to meet demand "well into the future" (according to the US Geological Survey's Mineral Commodity Summaries, 2018). If you want to turn bauxite into aluminum to make useful things like cans, cooking foil, and space rockets, you've got to get rid of the impurities and the water and split the aluminum atoms from the oxygen atoms they're locked onto. So making aluminum is actually a multi-stage process. First, you dig the bauxite from the ground, crush it up, dry it (if it contains too much water), and purify it to leave just the aluminum oxide. Then you use an electrical technique called electrolysis to split this into aluminum and oxygen. (Electrolysis is the opposite to what happens inside a battery. In a battery, you have two different metal connections inserted into a chemical compound and complete a circuit between them to generate electricity. In electrolysis, you pass electricity, via two metal connections, into a chemical compound, which then gradually splits apart into its atoms.) Once separated out, the pure aluminum is cast into blocks known as ingots, which can be worked or shaped or used as a raw material for making aluminum alloys. Making usable, shiny aluminum from rocky lumps of bauxite that you've dug from the ground is a lengthy, dirty, incredibly energy-intensive process. That's why the aluminum industry is so keen on recycling things like used drink cans. It's far quicker, cheaper, and easier to melt these down and reuse them than it is to process bauxite. It's also much better for the environment because it saves a huge amount of energy. 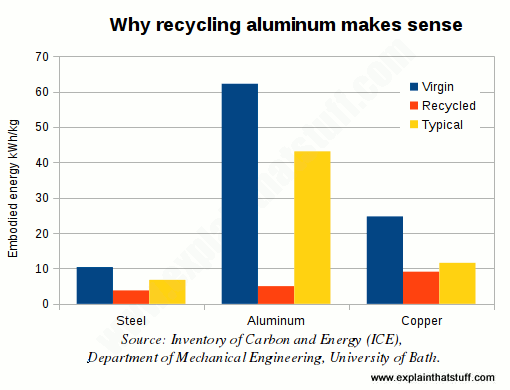 Chart: Why recycling aluminum makes sense. The amount of energy it takes to recycle metal for reuse (orange bars) is a fraction of what it takes to produce virgin metal in the first place (blue bars), but the difference is much greater for aluminum (center) than for either steel (left) or copper (right) because it's so hard to extract and refine aluminum in the first place. Data source: "Table 7.11 Embodied energy of selected materials" in Energy and Carbon Emissions by Nicola Terry, UIT Cambridge, 2011, based on data from the Inventory of Carbon and Energy (ICE) by the Sustainable Energy Research Team, University of Bath. Photo: Building an aluminum boat. 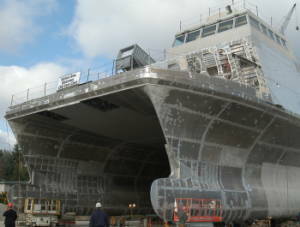 This high-speed aluminum boat, known as the Littoral Surface Craft-Experimental (LSC-X) or X-Craft, is shown here during construction in Freeland, Washington. Photo by Jesse Praino courtesy of US Navy. 1746: German chemist Andreas Marggraf (1709–1782) realizes that alum (a natural aluminum compound used for dying textiles since ancient times) contains an unknown metal. It's aluminum, of course, but he doesn't know that. 1809: English chemist Sir Humphry Davy (1778–1829) names this metal "alumium" and (later) "aluminium", but is unable to separate it out. 1825: Danish chemist and electrical pioneer Hans Christian Øersted (1777–1851) turns aluminum oxide into aluminum chloride and then uses potassium to turn the chloride into pure aluminum. Unfortunately, he cannot repeat the trick a second time! 1827: German chemist Friedrich Wöhler (1800–1882) also makes a small quantity of aluminum by heating aluminum oxide with potassium metal. 1855: French chemist Henri Sainte-Claire Deville (1818–1881) uses sodium to separate out aluminum. Since sodium is cheaper and easier to obtain than potassium, Deville is able to produce more aluminum—enough to make an ingot. He puts this on display at a public exhibition in Paris, France. Deville's new method means aluminum starts to become more widely available and the price begins to fall. 1886: Working independently, the American team of Charles Martin Hall (1863–1914) and his sister Julia Brainerd Hall (1859–1925) and Frenchman Paul-Louis-Toussaint Héroult (1863–1914) discover the modern method of splitting aluminum oxide with electrolysis to make pure aluminum. Their highly efficient technique, known as the Hall-Héroult process, is still used to produce most of the world's aluminum today. 1888: Austrian chemist Karl Bayer (1847–1904) finds a less expensive way of turning bauxite into aluminum oxide—the raw material needed for the Hall-Héroult process. Together, the Bayer and Hall-Héroult processes drastically reduce the price of aluminum, enabling the metal to be used in much greater quantities. 1899: A Dürkopp sports car with an aluminum body is unveiled at the Berlin International Motor Show. A few years later, the Pierce Arrow Motor Car Company produces its cars with cast aluminum bodies. 1901: Motor pioneer Carl Benz produces the first aluminum car engine. Early 1900s: First aluminum recycling programs. 1913: Aluminum foil first produced. 1920s: Modern aluminum alloys begin to appear. 1925: American Chemical Society officially changes the name from "aluminium" to "aluminum" in the United States. 1946: Aluminum is used for the bodywork of the lightweight, mass-produced Panhard Dyna X. 1957: The first aluminum power lines are introduced. 1959: Coors produces the first all-aluminum drinks can. 1975: Daniel Cudzik invents the stay-on ring-pull tab for drinks cans. 1990: The International Union of Pure and Applied Chemistry (IUPAC) officially adopts "aluminium" as its spelling. 1994: The Audi A8 sets new standards in lightweight car production with an aluminum body framework weighing just 249kg (almost half the weight of a comparable steel shell). 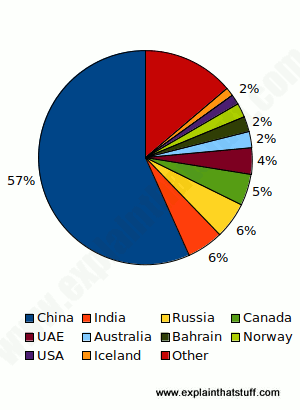 Chart: World aluminum production 2017: Although aluminum is produced in many countries, China now accounts for over half of world smelter production. US production declined by almost half in 2016, and fell by another 10 percent in 2017 to its lowest level since 1951, before increasing again in 2018. Source: US Geological Survey, Mineral Commodity Summaries: Aluminum. February 2019. 8% of Earth's outer crust (by weight) is made of aluminum. A block of aluminum weighs one third as much as a block of steel the same size. Aluminum foil is typically less than 0.15 mm (0.0060 in.) thick. Pure aluminum reacts rapidly with air to form a rustproof protective layer of aluminum oxide. Many cooking pots, pans, and tools are made of aluminum. It takes around 2–3 kg of bauxite (aluminum ore) to make just 1 kg of pure aluminum metal. Commercial ingots of aluminum are huge and weigh around 16 tons. It takes over 20 times less energy to make pure aluminum from recycled cans than from bauxite. 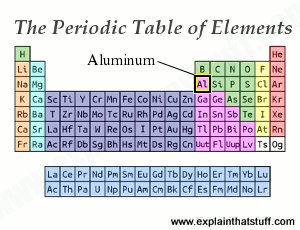 Artwork: Aluminum is in group 13 (III) of the periodic table, which means it loses three electrons to form positive ions (it has a valency of 3). Since it's near the top of the table, its atoms are relatively light compared to elements lower down the table such as lead. Atomic number: 13 (one aluminum atom contains 13 protons, 13 electrons, and 14 neutrons). The Aluminum Association: Leading trade organization with lots of useful information about aluminum. The International Aluminum Institute: Statistics: Useful worldwide production statistics, history, and publications. USGS: Aluminum: Reliable statistics about US and world aluminum production from the US Geological Survey. Alcoa: Website of a leading aluminum producer; includes quite a bit of background information about aluminum products, markets, and environmental impacts. Aluminum: Properties and Physical Metallurgy by John E. Hatch. American Society for Metals, 1984. A classic guide covering the physical nature of aluminum and its various applications. Handbook of Aluminum Edited by George E. Totten and D. Scott MacKenzie. M. Dekker, 2003. Two volumes covering properties, metallurgy, alloy production, and manufacturing. Aluminum by Heather Hasan. Rosen, 2007. A simple 48-page into covering the history of aluminum, physical and chemical properties, compounds, production, and uses. The Elements: Aluminum by John Farndon. Benchmark Books (Marshall Cavendish), 2001. A simple, solid, 48-page overview for 9-12 aged readers. The secret life of the aluminum can, a feat of engineering by Jonathan Waldman. Wired. March 9, 2015. Making drinks cans is a fascinating challenge in chemistry, biology, and engineering. Steel Industry Feeling Stress as Automakers Turn to Aluminum by Jaclyn Trop. The New York Times. February 24, 2014. Despite its advantage in price, steel is feeling the pinch from aluminum as car makers try to build lighter and more fuel economic vehicles. Green row over Iceland aluminum by Nick Higham. BBC News, 1 November 2009. A 2-minute video exploring why environmentalists are upset by energy-hungry aluminum smelting in Iceland. Power driven by Susan Demuth. Guardian, 29 November 2003. An article describing opposition to the Karahnjukar hydroelectric development. Bjork scorns 'crazy' Iceland smelter plan by Alex Kirby. BBC News, 2 January 2003. An early article describing opposition to the Karahnjukar hydroelectric development. Antiques: The Metal Of the Masses, Valued Now by Wendy Moonan. The New York Times, March 1, 2002. A fascinating introduction to the use of aluminum in jewelry, art, and antiques.